When the alien Chitauri threaten to destroy New York City, Tony Stark must suit up in his Mark VII heavy-combat armor to launch a nuclear missile at the approaching enemy fleet. Iron Man pushes the suit to its limit, losing power and crashing to the earth as the Chitauri are disabled and the wormhole destroyed at last. You know, the fact that all these Marvel Studios: The First Ten Years toys have two separate bio paragraphs is really wreaking havok with our standard page layout. The back of the box has the usual character-specific informational text, while the side has info about the movie the toy comes from. You're killing me, Smalls! Equipped with a mighty Vibranium arc reactor and enhanced flight capacities, the Mark VII is a Fully-Loaded Rapid Deployment suit built for heavy combat. We normally believe in a philosophy of "better late than never," but that only applies to figures that had no opportunity before. 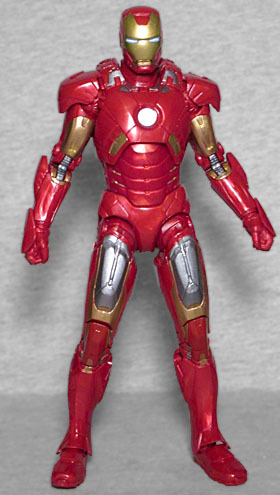 Hasbro has had innumerable chances to release an Iron Man Mk.7 in the six years since Avengers came out. Not just in the standard lines, but also in any number of multipacks. It's always been a weirdly conspicuous absence that they didn't make this armor in 2012, especially since him getting it was such an important part of the movie. Granted, not as important as him getting the Mk.6 in Iron Man 2, but still fairly central. And yet. It took a special, overpriced anniversary toyline for it to finally make it into plastic in the hobby's predominant scale. The figure's sculpt is entirely new. Perhaps that's why Hasbro didn't make one before? 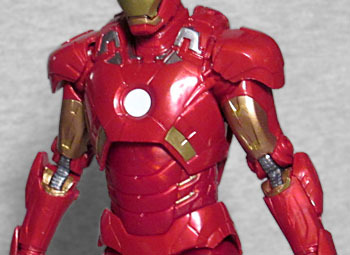 The only difference between the Mark IV and the Mark VI was the chestplate, so that meant molds could be reused - the Mark VII doesn't share parts with anything else. Comparing this armor to the one that immediately preceded it, the most obvious change are the bars that run over the shoulders. And, of course, the return to a round repulsor rather than triangular; remember, it wasn't the shape of the repulsor that was killing him, but what it was made of. Oh, and that stuff about Vibranium? This isn't the first toy to mention it. The movie never named it as the new element, but apparently it was in the script at one point, because the novelization specifically identifies it, and the toys confirm it as canon. A less-immediately identifable difference is the addition of a set of thrusters mounted on the back of the suit. The idea is that these will do the heavy lifting (so to speak) when it comes to flight, allowing the hands to be free, rather than being used for propulsion. It also gives the suit more speed and better handling. 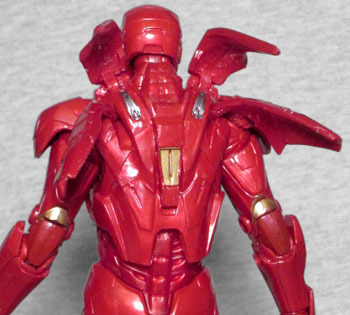 In the movie, a series of flaps open on the back of the armor, but the only way to do that here would have been to make separate, articulated pieces. So Hasbro made separate, articulated pieces. You can hinge them open to make him fly better! Colorwise, this suit moves the silver up from the knees onto the thighs, and the gold is just on the fronts and backs of the legs, not the sides. He also loses the silver on his biceps, leaving just gold (while the rest of the upper arm remains red). There are a few gold marks on the abdomen, and small notches just under the knees. The helmet is the usual design, with glowing blue eyes, while the repulsor is a flat white. Although it's a new sculpt, the helmet is mostly the same design it's not a massive difference, and also as the Mark II through Mark VI had, so means a big missed opportunity. Consider the Captain America vs. Crossbones set, with its alternate heads - why is there no Tony Stark head included here? Either bare or just with the mask part ripped off? We all recall Robert Downey Jr's contract with Marvel was up after four movies: three Iron Men and one Avengers; they extended that for Avengers II: Season of the Witch and Infinity War, but had to negotiate to get him into Civil War and Spider-Man, so maybe the new contract had higher prices for likeness rights? Whatever the case, it's a disappointment, especially with the quality of likenesses that Hasbro is delivering now. That's not to say there are no accessories, though. He gets an extra pair of hand with holes in the palms to accommodate the blast effects we've seen before - a translucent yellow this time. Rather than trying to articulate the hands and make us deal with the armored flaps on the back of the hands, these have the flaps molded with a 90° bend so the hands can be appropriately flexed back for the first time. Smart! 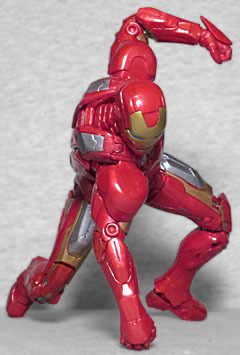 The articulation is the same as we've come to expect from Marvel Legends - with the addition of four hinges on the back-wings, of course: balljointed head, hinged neck, swivel/hinge shoulders, swivel biceps, double-hinged elbows, swivel/hinge wrists in one set of hands and plain swivels in the other, a balljointed chest and hips, swivel thighs, double-hinged knees, and swivel/hinged ankles. It's not quite enough to get him into a full superhero landing pose, but he's plenty poseable for lots of fun. 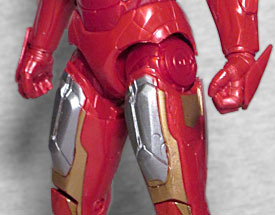 Iron Man Mark VII is a long-delayed figure. 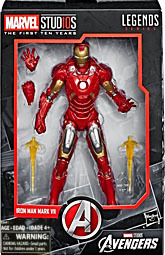 The armor debuted in Avengers 1 and appeared in Iron Man 3 (2012 and 2013, respectively), and we've been waiting for a toy of it ever since. This one is more expensive than it should be, and is missing at least one important accessory, but at last it exists. Six years delayed, it exists.